"Even my non-vegetarian friends ask for this delicious recipe!" 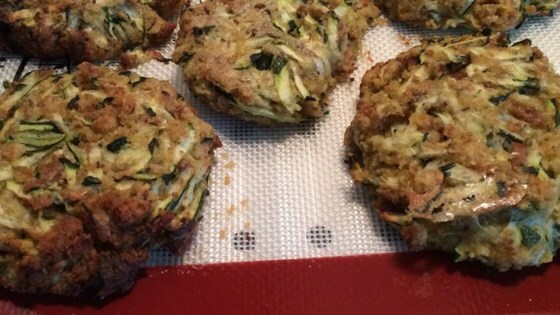 In a large bowl combine zucchini, bread crumbs, egg, mayonnaise, mustard and Old Bay Seasoning. Mix well and form into patties. Place on prepared baking sheet. Bake for 20 minutes and turn patties. Bake for another 20 minutes, or until golden brown. 5 stars after second batch made with 1/2 teaspoon Old Bay. 1 tablespoon of Old Bay made the dish very salty. I thought this was an excellent cake...my company really liked it. I added more chocolate chips on top and didn't bother with a frosting. I'll make this again. 4 stars on its own, 5 stars when red pepper, green onion, and feta cheese are thrown into the mix as well. Excellent! I was worried that my hubby would not like it cause he hates zucchini,but he absolutely LOVED this.